8 Circuit Studios - Building exciting games on the blockchain! 8 Circuit Studios – Building exciting games on the blockchain! The video game industry is pretty siloed. Game producers rely on centralized platforms for marketing, distribution, and payment collection. Additionally, gamers pour their heart and souls into games but all the assets that they cultivate are forced to stay within a game or system. 8 Circuit Studios is looking to introduce a blockchain-based system to improve experiences for gamers and producers alike by removing common pain points. This all points to their ultimate vision of creating a Metaverse, similar to the movie Ready Player One, where people can operate in a grand digital world that seamlessly integrates a bunch of smaller ones. Imagine – developers building interwoven game worlds and gamers taking their assets from game-to-game, never losing ownership nor value. Despite what many say, blockchain is not the one-size-fits-all solution for every industry’s problems. 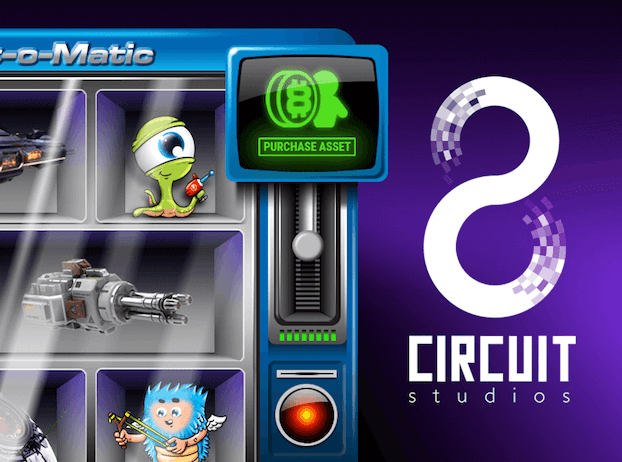 In order to successfully integrate games with blockchain, 8 Circuit Studios has designed their system with their users’ needs in mind. Specifically, gamers are focused on enjoying the game and not much else. This means that any blockchain solution would need to make it easy for gamers to access, store, and manage their tokens/digital assets. Game producers and publishers have unique needs as well when it comes to operating in a blockchain-based ecosystem. They need tools for creating and managing digital assets, a platform for distributing these assets, and a way to receive fair compensation for their work. 8 Circuit Studios’ solution is a 3 pronged system that includes a platform, products (games/digital assets), and set of underlying protocols. In terms of the platform, 8 Circuit Studios has created an Ethereum-based platform which will enable the creation/handling of digital assets via smart contracts. For gamers, the 8 Circuit Studios Platform offers them a portal to manage wallets, tokens, and digital assets. For producers/publishers, it offers them a bridge between their new “open” digital assets and their game worlds. 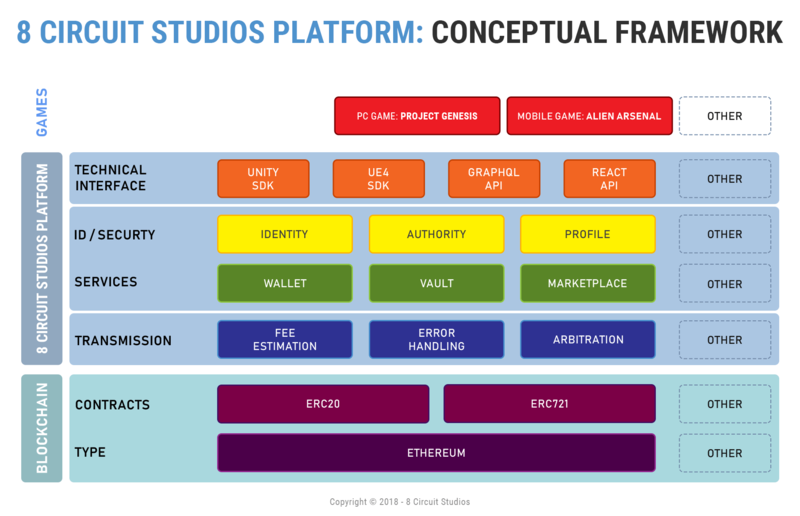 Below is a diagram of how 8 Circuit Studios Platform is setup to integrate with Ethereum on the bottom and common game development frameworks on the top. In terms of video games, creating them is one of 8 Circuit Studios’ primary focuses. They believe that the best way to grow their ecosystem is to offer amazing games that people love to play. Additionally, by creating games, they can show producers/publishers examples of what can be done with blockchain-based games. Initially they will launch 2 games across mobile, PC, and console. The first one is called Alien Arsenal: Battle for the Blockchain, which is already out in the iOS/Android app stores. It is a collectibles game which gives players a glimpse of what it’s like to interact with the Ethereum blockchain. The second game is called Project Genesis, a space-based survival game which is scheduled to be released late 2019. These games will be very fun to play, but more importantly, they will show gamers, publishers, and producers what is now possible for their digital game assets using the 8 Circuit Studios system. And finally, 8 Circuit Studios will create a set of protocols to manage digital assets in a blockchain-based game world. Before, in-game assets were siloed and restricted. But now, blockchain allows them to be openly shared, transferred, and tracked. 8 Circuit Studios’ smart contracts will manage all these aspects of the digital assets operating in their ecosystem. The 8 Circuit Studios video game ecosystem will utilize an ERC-20 token (8BT) to handle in-game purchases as well as power smart game objects. It will work across all games within the ecosystem. Furthermore, it gives people interested in video games + blockchain an easy way to participate in the space. 8BT is available in the upcoming wave 2 token sale. There will be 5 waves of token sales total – each one scheduled to happen along with major releases or milestones. You can find out more information about how many are offered in each wave, at what price, and how they are allocated here: https://www.8circuitstudios.io/#token. The 8 Circuit Studios team is led by Nintendo and Microsoft veterans who love blockchain and building games. They’ve held integral roles in developing brand name games such as Halo, Sims, Donkey Kong, Age of Empires, Super Mario World, and more. With a team of currently 15, based primarily in the U.S., they are equipped to tackle their goals with their undeniable experience and valuable connections in the video game industry. After starting in mid-2017, they’ve held a Wave 1 of their token sale, held an airdrop of their 8BT tokens, and released their first mobile game, Alien Arsenal. Looking forward, they will hold another wave of their token sale, start launching major features, and culminate with a big alpha release of their Project Genesis game in mid-late 2019. 8 Circuit Studios definitely has an interesting approach to improving video games using blockchain tech. Their focus on building addictive games along with their close ties to the broader video game industry makes them a formidable force. Furthermore, the progress they’ve made since their inception gives them a track record to build off of. We will follow along and try out 8 Circuit Studios’ games to see if they can really take off and make this project successful as a whole. We are a professional site that sometimes receives compensation from companies/organizations to review their products or services. This article is sponsored content as such: it may be a sponsored article, contain a mentioning of one of our sponsors and/or advertisers and/or the page may contain affiliate or referral links, meaning in that case at no additional cost to you, we will receive a commission if you click through such link and make a purchase. We are independently owned and the opinions expressed here are our own.